With the most recent estate tax changes, the majority of investors will not have an issue with the federal estate tax due to the high current level of exemption ($5.45 Million in 2016). Unfortunately, in addition to the federal estate tax many U.S. states have their own estate and inheritance taxes with the same or sometimes lower exemptions. Estate taxes are charged against the estate regardless of who the heirs are, while inheritance taxes are levied on the transfer of assets, and can differ based on the relationship to the deceased. 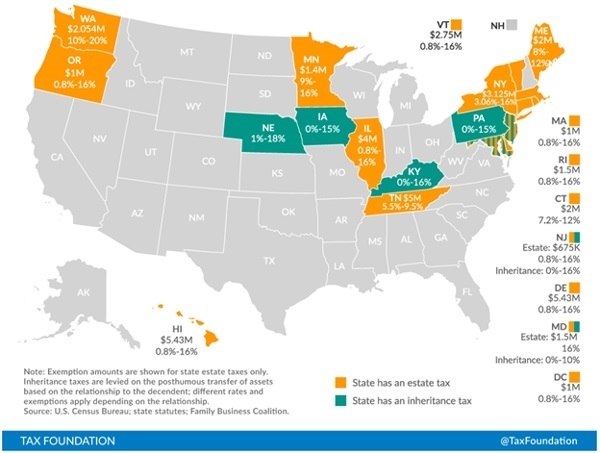 Currently, fifteen states and the District of Columbia have an estate tax, and six states have an inheritance tax. Maryland and New Jersey have both1. You will notice that New Hampshire is the only state in New England that does not have an estate or inheritance tax. Massachusetts has the lowest exemption in NE of just $1 Million. As retirement gleams in the distance, the tax situation in potential retirement states should be considered as well. Consider a client in New Hampshire who will retire in Maine to be closer to grandchildren. Moving from a state with no estate tax to one with an 8%-12% estate tax starting at $2 Million could be a potential issue for heirs. So even if you will not owe federal estate taxes (under current law), don’t lose sight of potential estate tax liabilities in your current or future home states. Remember, as a financial planner, I can help with this planning as well, so don’t hesitate to call. Content in this material is for general information only and not intended to provide specific advice or recommendations for any individual. Tax laws are subject to change.